New BMS sniper T350 UTV. 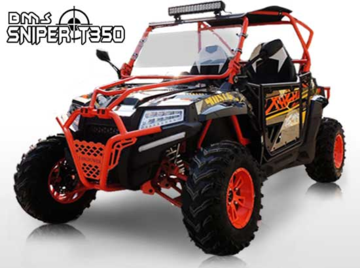 This UTV for sale is solid, whether it is honda, Zusuki, Yamaha, Kawasaki, or Polaris we incourage you to compare quality, price, performance and style. Side x side fully automatic cvt trans with reverse, high grade supension, water cooled, 4 stroke single cyclinder engine. All the style and capabilities of the Polaris Rzr, but without the huge sticker price! Have any questions? Give us a call anytime we would be happy to speak to you about our very aggressively priced new BMS all terrain atv. Make this your UTV and have everyone asking you how you could afford the same machine they paid twice as much for. The smile will be yours and the style like no other. We didn't miss a beat here folks! Our entire staff is excited over this 4 wheeler and cannot wiat to hear from you! AVAILABLE 12/10/2016, ACCEPTING PRE-ORDERS NOW! Items not covered by the warranty above may be covered under the initial set up of the vehicle if reported to CMS by the dealer as soon as the unit is uncrated. Please remember to inspect each unit, and to list all damages you see to the outside of the box on the bill of lading, as well as take photos of the damage. Drivers can be pushy, but to insure proper reimbursement and a prompt resolution, all damages must be reported to CMS, as well as the shipping company upon delivery. In most cases the driver has the ability to contact their office and request a claim number for you on the spot. THE CUSTOMER DOES NOT USE A PROFESSIONAL MECHANIC (ENGINE REPAIR SHOP, MOTORCYCLE SHOP, OR AUTO REPAIR SHOP) OR AN AUTHORIZED CMS DEALER TO ASSEMBLE AND PREP THE PRODUCT PRIOR TO OPERATION. CMS does not reimburse any labor cost. However CMS does provide free in house labor on defective motors and installation of defective parts that are still under their specified warranty period. If your product is still under warranty, you must contact our office to obtain an RMA number in order to return any part for exchange, or engine for repair. In most cases, CMS will cover the shipping charge to get the defective part back to our location in the City of Industry. We will pay return shipping to you unless it is determined your part was abused, misused or damaged in any way other than a manufacturers defect. Your dealer may handle the parts exchange for you at no expense, however the option to do so is that of the dealers and we have no control over our dealers in house parts exchange policies. CMS is not responsible for the costs of return shipping and these costs must be included with the initial part order if not under warranty. If shipping funds are not included, we will not ship the part. CMS reserves the right to inspect the defective part before replacing it. In some cases CMS will require the customer to send in the defective part for inspection before an exchange can be made. The inspection process could take from 2-4 business days after its arrival to the designated inspection office. CMS will decide if the part in question is defective or otherwise. It is the responsibility of the buyer, dealer and distributor and/or end user, and not CMS, to ascertain, and obey, all applicable local, state, federal and international laws in regard to the possession, and use, of any item purchased from CMS. All equipment is sold subject to public law and any local, state or federal ordinances or international law. Dealers and end users must consult their local, state & county laws before ordering or purchasing products made or distributed by CMS. Dealer/Distributor agrees that absolutely no sales of any of our motorized products will be to minors. By placing an order, the buyer represents that the products ordered will be used in a lawful manner and that he/she is of legal age. CMS will not be held liable for the misuse of any product purchased from us or any of our distributors & dealers. Purchaser hereby certifies that He/She is over 18 years of age. Purchaser has carefully read the foregoing and acknowledges that purchaser understands and agrees to all of the above terms and conditions. Purchaser has had the opportunity to ask any and all questions regarding this agreement and the effect of the same. Purchaser is aware that by ordering and sending payments for any item(s), purchaser assumes all risks and waives and releases certain substantial rights that the purchaser may have or posses. Purchaser therefore releases all liability and waives any and all rights the purchaser may have in regards to purchases made of product directly or indirectly from CMS. Imported and distributed by CMS MOTORSPORTS, INC.